During my last 4 years of ministry, I have had the wonderful pleasure to visit a number of Christian churches and attend their service. Most of those services were in the St. Louis area, the city where I also run my ministry Testimony House. I have seen Jesus glorified by many different denominations in different styles of praise by different types of congregations. I have seen so many wonderful places to worship God and fellowship with other believers in our city, however I have also seen themes of segregation, separation and superiority run throughout many of them. I have seen that many churches in St. Louis are segregated by race, but not necessarily on purpose. I have seen many St. Louis area churches separate themselves by styles of praise and worship, and again, not necessarily on purpose. Lastly, I have seen that many churches in St. Louis act with superiority, however I am not sure it isn’t on purpose. WHAT IS THE CHURCH OF SUPERIORITY? 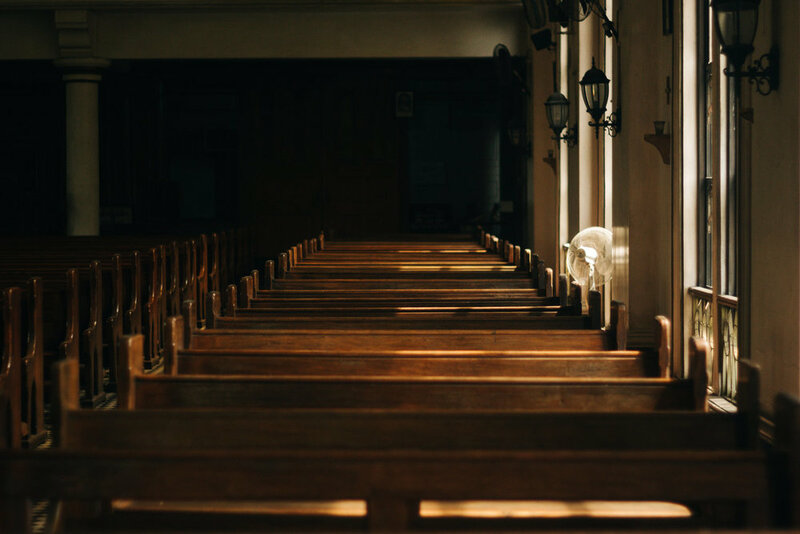 Even though I spent many of my early years attending a Baptist Church, when I found Christ for real at 29, I was a pretty much a clean slate when it came to my view of any church denomination, service order and praise style. I saw Christ as Lord, I was open (not necessarily comfortable) with many of the different things I was seeing at different denominational services. Yet the more I spent time fellowshipping with other saints, I realized my open-mindedness wasn’t a wide-scoping Christian act. I was shocked to find other Christians verbally, and even on a few occasions physically, make fun of the styles and differences of other Christian churches. I am not trying to say, “I know how to be a good Christian, act like me.” Like I said, just because I was open in my heart to seeing different things in the church take place, didn’t mean I participated in them or was excited they were taking place every time. I am simply trying to share the shock I had when I found out other believers, at churches throughout the area, had a superiority complex when it came to comparing their church or beliefs to other churches and Christians. Maybe it was because of my new Christian naivety, but I just assumed that other Christians always acted with love and respect towards their brothers and sisters. I found, it wasn’t. I had real conversations with different Christians from different denominations where people would tell me why their church was better, relate the grand success of their church based on membership numbers or, the most common thought was, to tell me all the reasons why another nearby church was dying. I thought it was strange the first time I saw a sense of pride being exhibited from a Christian brother when they talked about how a nearby church was dying while their church was growing. My first thought was, shouldn't other churches be praying for dying churches. Shouldn't nearby churches be standing up and putting their faith in God with their Christian neighbor to restore what the enemy tried to steal? This superiority complex phenomenon cannot continue if the revival of St. Louis is ever going to take place. Jesus did not call his church to be one of separation, segregation and superiority, but one of sincerity, similarity and submission. WHY DO CHRISTIANS FEEL PRIDE? Our sin nature is in opposition to Godly behavior. Our flesh desires to blame God when life goes wrong and take the credit when it goes right. Our choice as a Christian is to love God even when circumstances are difficult and to thank God for every blessing instead of ourselves. How does individual sin nature create a Church of Superiority? Wether it's rooting for our favorite sports teams to win the championship or supporting our children to succeed in their endeavors. We take pride in seeing things do well when we invest our time and energy in them. On the other side, we experience pain or sadness when we invest ourselves in teams or people that don’t do what we hope they will. There is no greater thing to be proud of then Jesus. He is literally perfect. Being a part of His kingdom should bring joy and hope into our lives, but a prideful attitude towards others because God is awesome is unhelpful in growing the body of Christ. The world already stereotypes Christians as narrow minded people who lack the ability to love others who live sinful lifestyles. I believe Christians sometimes come off that way because we know Jesus is perfect and as we want to share those perfect teachings of Christ with the world, but we do it in imperfect ways. In this same way, we have so much pride in the Jesus that our church or denomination teaches us about, that we see the theological differences and service styles of other denominations through superiority complex glasses. HOW DO WE REPENT AND CHANGE? Repenting for our sins should be a daily activity in the life of a believer. Sinning is a natural part of the human condition and God wants us to own up to those sins and allow grace and mercy to take them away through sanctification. However, without repentance we are destined to fall back into the sins of our past. So, if a church has a superiority complex chances are they don’t even notice. I would be surprised if the leadership of every church I heard negative congregational comments from would endorse or even be aware those things were taking place in their church. However, that does not mean the leadership of churches don’t have any part of the blame. For the most part, a congregation exhibits the behavior of their leaders. If a preacher gets on the pulpit and bashes every charismatic preacher they can think to name, the church will exhibit similar behavior. Which is to focus on anything other than the love Christ had for all. Not to mention the awful example it could be to someone who isn’t saved who may be attending that church for the first time. Are they being edified? Is that the gospel? Is that the lasting impression the church wants to leave on the community? In the same way, to watch a charismatic church pour oil on every person who walks through the door and constantly speak out in tongues is also not edifying to someone who may not know Christ. I know you may be thinking, “Those things need to be done.” And I would agree that we shouldn’t turn all of our church services into McDonald’s, where no matter where you go you can expect the same experience. However, we do need to know that those leadership behaviors do not always encourage the harvest, and when they are filtered down into our congregations it can create a schoolyard “No, my church is better” divide between Christians. Repentance will change the future of the church in St. Louis. If repentance takes place in every church that struggles with this sin I believe the revival of St. Louis will be remembered forever. However, repentance will only come when church leadership evaluates and explores what God would have them do in regards to the vision of that church. And this is where real change can take place. Nowhere in the Bible did Jesus teach us by example to do the exact same thing in the exact same way. Jesus told the woman at the well her life story, paid a debt out of a fish, had a man put mud in his eye to be healed of blindness while simply telling a man with a withered hand to open it. Throughout the Bible, Jesus adapted to the situation and had clear goals for how he would help a particular person. All the while, the gospel message was being preached and accepted based on His acts of servitude for all He came in counter with. If Christ was alive today, do you think He would call himself a Baptist, a Methodist, a Charismatic or any denominational heading? However, if he were here, do you think He would fail to visit any of those denominations? What about the people of sinful lifestyles that our churches neglect today? Jesus Christ was adaptable. He loves everyone where they are. I do not believe Christ would be worried about what type of services we had (although when He comes back I’m sure we will all learn where we missed the mark). I also don’t think Jesus would be more proud of a church with high attendance any more than He would be more proud of a small church with fortitude. My point is this, after our churches repent of seeing our buildings and beliefs as better than others, let’s go to God and grab a hold of the vision HE has for our church. Stop worrying about what other churches or denominations are doing and focus our attention on the task Christ has set ahead for our church. Another constant theme throughout the churches I've visited is a church mission or vision statement. This statement is usually included on a church website or bylaws. This statement is supposed to list in clear and precise language the goal(s) of that particular church. However, through my intentional, albeit probably limited, research, the vision statements of the churches I have been to are mostly vague, old, or in some cases nonexistent. Let me give you some examples, I will not point out the church or copy the entire statement because I want this to be in love, but feel you need to see for yourself what I see. Vision Statement 1 (100+ member church) – we want to be a church that advances the gospel throughout the nations. These are just a few, and I think it’s also worth noting many churches do not have ANY mission statement or simply declare their statement of beliefs as their mission. Here’s the problem I see. Jesus did specific things for specific people, that’s the church He died to build. Yet churches across denominational lines, regardless of size, plant churches with vision statements that lack specifics. Are the needs of a community in one city different from another? Of course they are. Yet we continue to provide fast food churches. Meeting needs in one way since 1906! We have different denominations which is equivalent to choosing Wendy’s over Burger King. They both have burgers and soda they just serve them differently. Even restaurants long ago learned to serve the needs of that community. Seafood restaurants are prevalent where there is fresh water access. Steakhouses are more common near the cattle ranch. When a restaurant chooses to serve food the community doesn’t want or like they stop coming. Those restaurants have to adapt or close. Our churches have not learned that lesson. I have seen some of the churches with a storied history are still holding onto the vision statements of the original pastor from 100 years ago. Has that community not changed? The roads, the buildings and all the people from that generation are gone but we still hold the vague visions of leadership from decades ago instead of meeting the needs of our community where they are? Churches are unlike business and shouldn’t be treated as such, but we can learn from them. Business create clear vision statements, develop methods and train their employees to implement those plans. So to change St. Louis we must transform the vision of the churches. How do we do that? 1) Rewrite the Church Vision to be Specific – Vague statements, even if they good things to do, are not aimed in any specific direction. Jesus preached the gospel while helping with specific problems people had that came to Him. We need to guide our churches to see the specifics of what God wants them to do. 2) Develop Methods of Service – Outside of Sunday services, many churches I have seen focus on knowledge growing activities like Bible studies, small groups and children's education. Growing in knowledge of God is not the only way Jesus blessed others, but it’s often the only community serving ministry done by some St. Louis churches. Jesus healed the sick, provided specific needs to those that asked, and went to where people were instead of asking the world to come to Him. Let's stop inviting the community to us and go to them instead and not just to hand them a flyer for church! We need to guide our churches to create new methods (more than a benevolence ministry) that serve the needs of others instead of focusing solely on education. 3) Train Our Congregations - To remove an atmosphere of superiority Christian church members, we must train our brothers and sisters to love and respect other Christians. Jesus taught this in word and by His actions. The message to be a servant of all is a theme throughout Jesus teachings. We need to guide our congregations to act differently by allowing the leadership to act first and be the example. Do You want to your church to be a multi-cultural church for your multi-cultural community? Do you want your church to be a place where city livers can implement Christ teachings into busy city lives? Do you want to be a church focused on family growth and education? Write these visions down. Want to develop new methods of service? Aim for needs in your community. Does your community need childcare? Is there a way you can feed those in need? Can your church be a safe haven for people who are struggling with abuse? Needs are endless, I don’t know what you should do, but God does. Ask Him for new and creative ways to be a blessing to others, and walk those plans out. Want to train your congregation to change their attitude? Can your church reach out to other denominations in your area and share services from time to time? Can your church leadership teach on something that may be controversial while sharing both sides of the argument? Leadership must be the first ones to break down walls that divide, the body of Christ will follow behind the opening. I know you may be thinking, “we’ll we do those things” or “we want those things to happen but they aren’t our vision” My question to you would be this. Why does your church exist? It shouldn’t be as vague as to make disciples or preach the gospel because the church should do those things anyway. A vision, by definition, is something you can see. Can you really see if everyone in your church has been made a disciple or see if your church is built on a foundation of gospel roots? Of course not. The Bible says “Without a vision people perish but Happy is he who keeps the Law.” In the gospel Jesus said the law now rests on two commandments, Love God and Love Others. How is your church doing those two things? If St. Louis churches continue to operate without visions that they cannot see come to pass, they will continue to perish. The churches of St. Louis have an abundance of examples to look at. Drive down most major roads long enough and you will find the remains of a church that lacked vision or a congregation to follow it through. That also doesn’t mean churches that are still standing have vision. I am not saying that all churches without specific vision statements are going to perish. I just want the body of Christ in St. Louis to see the need for specific ministries in very different communities. God has a great plan for all our lives and He has a great plan for our churches to serve in very specific ways. None of those specifics will prevent us from gospel sharing, but instead improve it. When we make our church the hands and feet of Christ, we will find ourselves serving the gospel message better than we ever had before.